...... Double-clicking on a file in the playlist will cause it to start playing. 1. Support for Audio Interchange File Format (.aif and .aiff) files. 2. Support for Apple SND (.snd) files. 3. No more installer-based advertising. 1. Support for Wavpack (.wv) files. 2. Support for Wave (.wav) files. 2. Fixed function of pause button so it behaves as a pause rather than stop. 3. Added "load directory" button. 4. Playlist now supports drag-and-drop. 5. Volume control slider added. 6. 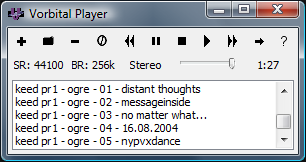 Added "clear playlist" button. 7. Fixed a handful of bugs and oddities. 8. Add file button now supports multiple selections. Qweas is providing links to Vorbital Player 3.1 as a courtesy, and makes no representations regarding Vorbital Player or any other applications or any information related thereto. Any questions, complaints or claims regarding this application Vorbital Player 3.1 must be directed to the appropriate software vendor. You may click the publisher link of Vorbital Player on the top of this page to get more details about the vendor.